Double DelightsTM treats are a perfect bite-sized treat for your small dog. These delicious filet mignon flavoured treats have a tasty outer shell and a yummy soft centre that your small dog will love and you'll love giving. Double DelightsTM treats are nutritionally complete and balanced for adult dogs, with no artificial flavours or colours, and are preserved with natural ingredients. 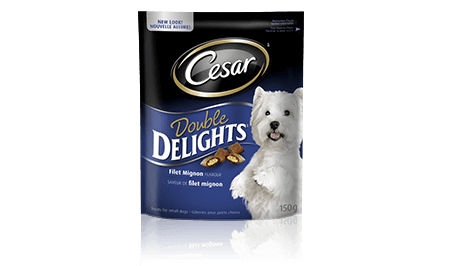 CESAR® DOUBLE DELIGHTS® TREATS: FILET MIGNON FLAVOUR 150g is rated 5.0 out of 5 by 2. 5 to 10 lbs. - 8 to 14 pieces per day* 10 to 15 lbs. - 14 to 19 pieces per day* 15 to 20 lbs. - 19 to 24 pieces per day. * *Represents approximately 10% of a typical daily caloric requirement for an adult dog. Keep fresh water available at all times. CESAR® DOUBLE DELIGHTS® Filet Mignon Flavour treats for small Dogs is formulated to meet the nutritional levels established by the AAFCO Dog Food Nutrient Profiles for Adult Maintenance. CHICKEN MEAL, GROUND CORN, ANIMAL FAT (PRESERVED WITH MIXED TOCOPHEROLS), BREWERS RICE, WHEAT FLOUR, GRAIN DISTILLERS DRIED YEAST, CORN GLUTEN MEAL, DICALCIUM PHOSPHATE, GROUND MALTED BARLEY, SALT, NATURAL FILET MIGNON FLAVOUR, IRON OXIDE, dl-METHIONINE, TAURINE, VITAMINS (ASCORBYL PALMITATE [SOURCE OF VITAMIN C], FOLIC ACID, CHOLINE CHLORIDE, dl-ALPHA TOCOPHEROL ACETATE [SOURCE OF VITAMIN E], VITAMIN A SUPPLEMENT, NIACIN SUPPLEMENT, VITAMIN B12 SUPPLEMENT, RIBOFLAVIN SUPPLEMENT, THIAMINE MONONITRATE [VITAMIN B1], d-CALCIUM PANTOTHENATE, VITAMIN D3 SUPPLEMENT, BIOTIN, PYRIDOXINE HYDROCHLORIDE [VITAMIN B6]), MINERALS (ZINC SULFATE, CALCIUM CARBONATE, POTASSIUM CHLORIDE, COPPER SULFATE, MANGANESE SULFATE, POTASSIUM IODIDE).